Ukraine has concluded deals with eleven countries of the EU on delivery of weapons, including lethal, President Petro Poroshenko told the country’s TV. He, however, didn’t mention which countries will provide ‘defensive aid’ to Kiev. “The Head of State has informed that Ukraine had contracts with a series of the EU countries on the supply of armament, inter alia, lethal one. He has reminded that official embargo of the EU on the supply of weapons to Ukraine had been abolished,”saida statement on Poroshenko’s official website, citing his interview to the TV channel "1+1". 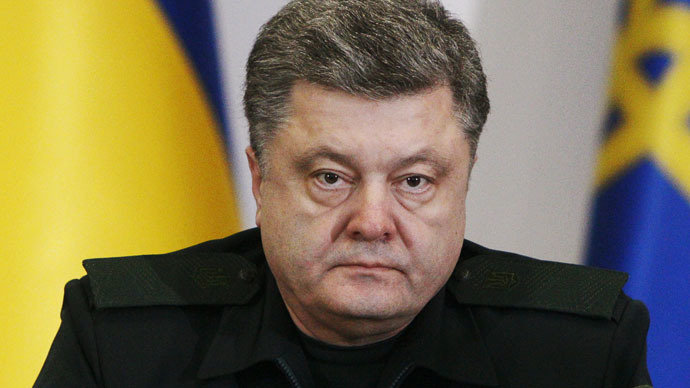 According to Poroshenko’s statement, he is confident that EU and USA will support Ukraine with weapons if needed. Ukraine won’t reduce its defense capacity, said Poroshenko, adding that now “intensive combat training is being held” in the country. “We are mining the most dangerous tank directions and building engineering structures under the new plan and projects." The statement said that the decision of the US President Barack Obama “who decided to supply Kiev with defensive weaponry” is crucial. The Ukrainian leader said the situation in Donetsk and Lugansk Regions is being gradually deescalated, adding that the Ukrainian army hasn’t suffered casualties for several days. In the meantime, the head of the self-proclaimed Lugansk People's Republic, Igor Plotnitsky, said he doesn’t understand why Kiev is planning to buy weapons while the country is seeing a peaceful process. He was referring to a peace deal which was struck between the Ukrainian government and the rebels in the south-east of the country in Belarusian capital Minsk on February 12, after almost a year of fighting. “We have a question: why do they [Kiev authorities] want weapons if they were the first to demand peace?” Plotnitsky asked. On Wednesday US Secretary of State John Kerry confirmed that Washington was to send Kiev more non-lethal military aid, including drones and armored Humvees. “We are today providing immediately some $75 million of additional non-lethal assistance, immediately, to Ukraine in order to help them in non-lethal assistance,” Kerry told the Senate. Washington is not the only state which openly announced military aid to Ukraine. The UK said that it will send 75 British military personnel in March who will offer medical, intelligence and infantry training to the Ukrainian army. Poland has also said it is sending military advisors to Ukraine. However, not all countries share the enthusiasm. America’s NATO allies, namely France and Germany, have spoken against arming Ukraine, a move that could shatter the fragile peace that have just settled in the country torn by a civil war. Germany has been one of the most vocal critics of sending arms to Ukraine and now the country’s officials question NATO’s assessment of the situation in the country. The armed conflict in Ukraine’s south-east began in April 2014, after Kiev sent its military to the area, as locals refused to recognize the new coup-imposed authorities in the capital. The fighting has seen over 6,000 killed and nearly 15,000 injured, according to the UN Human Rights Office.